You are here: Home / Currently Featured / Beaujolais beyond nouveau! Every individual recalls the moment that they succumbed to wine. It is unique and unforgettable like a first kiss or the sensation of absolute freedom when a bicycle is unshackled from training wheels! Mine came in 1988 in the raucous halls of the Salon de l’Agriculture in Paris – an agricultural extravaganza where every conceivable, farm-related product is on display. A group of us had gone to see a prized Brittany show horse, the Postier Breton that belonged to a friend’s brother. Wandering the great halls we happened upon the Beaujolais stand. The wines were essentially free –a revenue exclusion zone perfectly tailored to my post-college status! From that day, the realization that there was more to Beaujolais than nouveau has never left me. Anatomy of a wine region. In reality, the striking, commercial success of Beaujolais nouveau has long eclipsed the remarkable wines produced in this southernmost district of Burgundy. A majority of consumers who have reveled in the exuberant festivities of a Beaujolais nouveau release have never heard of Moulin-à-Vent, Fleurie, Morgon, St.-Amour, Chénas, Chiroubles, Brouilly, Juliènas, Régnié or Côte-de-Brouilly – the 10 Crus AOC of Beaujolais. While some white and rose wines are produced the district is overwhelmingly famous for its reds. Typically made 100% from the Gamay variety, up to 15% of Chardonnay, Aligote, Pinot Noir, Pinot Gris and Melon can be incorporated into the blends. The unique process for crafting the red wines of Beaujolais is one of semi-carbonic maceration. Namely, whole bunches are hand harvested and without being pressed, crushed or destemmed put into tank where bottom clusters burst under the load’s weight. The grapes’ natural sugars combined with wild yeasts present on the skins induce an intra-cellular fermentation inside the berries. The free-run juice from the bottom clusters is racked, or drained off from the remaining bunches to holding tanks and after 8-15 days for the crus (only 2-3 for nouveau) combined with the juice, or press wine from the carbonic clusters. The blend is fermented and then aged either in stainless steel tanks, concrete vats or oak casks. This carbonic maceration technique makes for vibrant, highly fruity wines often exhibiting candied aromatics of banana, red raspberry and cranberries sometimes with hints of soft peppery spice. 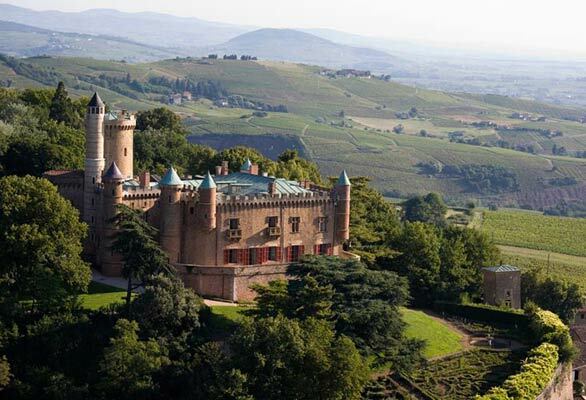 The magnificient Chateau de Montmelas – imposing seat of power of the lords of Beaujeu! The three quality tiers begin first with the regional Beaujolais AOC/Beaujolais AOC Superieur requiring a minimum alcohol content of 9.5% and 10% respectively. Only red and rose can be designated Superieur. Second is Beaujolais Villages that signals a higher quality designation by including the village name on the label. Viticulture practices are more tightly controlled and the wines are somewhat more tannic and densely colored as a result of the granite-based soils from which they originate. Here the minimum alcohol requirement is 10%. Finally are the 10 Crus AOC of Beaujolais. These are the most complex, textured and significant wines produced in this region. Yields are the lowest allowed. Wines are dominated by Gamay but can include 15% of the aforementioned varieties. Here minimum alcohol is 10% and 10.5% for special climat designations. Exceptionally, Regnie must be 100% Gamay and Côte-de-Brouilly cannot include the Pinot varieties. 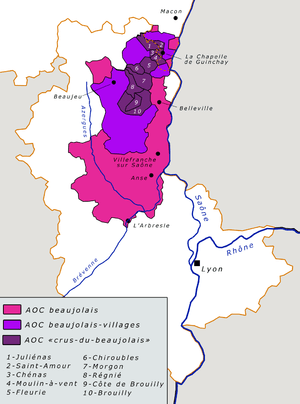 The Beaujolais vineyards, like many of the great wine regions of southern Europe were first planted by the Romans. Crus like Juliénas named for Julius Ceasar are eponymous reminders of this Roman heritage. Wine styles range from the early-drinking, lighter-bodied and generously fruity wines of Fleurie, Chiroubles and Brouilly to the more structured and age-worthy offerings the likes of Chenas, Morgon and Moulin-à-vent. I recently tasted two different Crus offerings from the remarkable 2009 harvest that many consider to be of once-in-a-lifetime pedigree. Both showed the power of the vintage as well as the purity of their respective appellations. Meticulously hand harvesting, row by row. The 2009 Chateau de Saint-Leger from the southernmost and largest Beaujolais district of Brouilly showed a deep, ruby-purple hue and heady aromatic notes of kirsch, saffron and curry spice as well as sun-dried black, Greek olives, savory honey-baked ham, fresh-cut tobacco and hints of clove. On the palate the wine had a beautifully lush, silky texture, lovely weight and fleshy, sweet cranberries interwoven with orange peel, hints of tar and bright, refreshing acidity. The wine showed wonderful equilibrium and lingered impressively on the palate. This is a fantastic value for $14.99 per bottle! The 2009 Potel-Aviron Morgon Cote du Py from one of the six special climats of this Cru was almost inky black with a pronounced purple tint reflecting the iron and manganese-rich soils of this terroir. The nose exhibited exotic sandalwood, dark, black fruits, leather, soy, dried leaves and soft, sweet tobacco. The palate showed pronounced depth of rich plums, blackberry and tart cranberry fruit, grilled black figs, soft red peppercorn and just the right balance between lush texture, evident yet highly approachable grip, cleansing acidity and a beautifully persistent finish. This wine can be cellared for five years but is truly delicious right now! It retails for only $17 per bottle and should be purchased by the truckload! By all measures the 2010 vintage for the region was another of very high quality and many are wondering if this on the heels of the truly brilliant 2009 results heralds a golden age for the region’s wines. If ever there was a time to explore the distinctly diverse and qualitative offerings from the southern tip of Burgundy it is now! You see, when it comes to riche, nouveau is not where the party really starts! Never been huge fan of Beaujolais, but damned if I’m not going to try to find one of the ones you mentioned particularly the 2009 Chateau de Saint-Leger. You made it sound so deliciously inviting. Cheers for another revealing article Mick. Much to look for in the fabulous 2009 vintage. Again, for bigger, more structured wines look to Moulin-a-Vent, Morgon and Chenas. For more fruit-forward and somewhat softer wines go to Brouilly, Fleurie or Chiroubles. Delicious Mick! Where to buy?? A good resource for finding wines is http://www.winesearcher.com. This will give you retailers selling these and other wines by the same producer where applicable. In this instance I purchased both at K & L wines (www.klwines.com) in San Francisco.